Even if live-action role-playing doesn't interest you, this amazing art that explains it will. Live-action role-playing is not something you can jump into on a whim. No, there are rules which must be adhered to, and sacrifices which must be made. Thankfully, artist Nick Edwards has laid these out for us in beautiful comic book form. Edwards' narrators, an abstract version of the Human Torch and a talking ice cube, help us to understand the practice of grown men and women dressing up as warriors from various real and imaginary historical periods to battle to the fake death using foam weaponry. 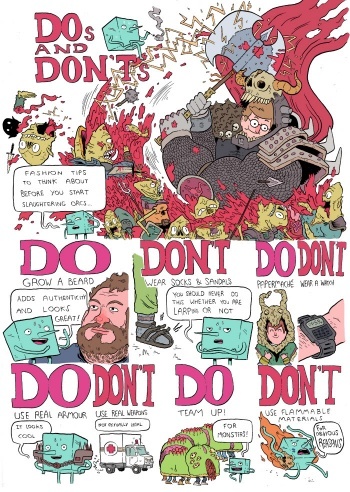 It covers everything from the various genres of LARPing, to the dos, don'ts, and pitfalls. For example, LARPers should "grow a beard," but should not "wear socks with sandals." And were you aware that hitting someone too quickly is called "machine gunning?" I wasn't, but now I am, thanks to Edwards. While LARPing can be a fun fantasy, Edwards also points out the dangers. These include going completely loony by believing the LARP is real, spending all your time and money on equipment, and becoming obsessed. There's a whole big thing with real-life relationships amongst LARPers too, evidently. I have friends that LARP, but I never had much of a desire to get into their lives past one showing me a chainmail shirt once. Edwards' awesome art gives me that desire. He could tell me about the difference between white shades of paint and I'd still be intrigued. More of his work is available at Team Dynamite and his blog.